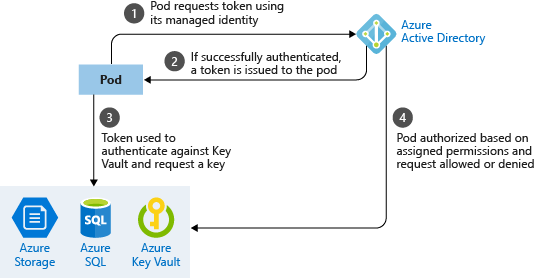 As you develop and run applications in Azure Kubernetes Service (AKS), the security of your pods is a key consideration. Your applications should be designed for the principle of least number of privileges required. Keeping private data secure is top of mind for customers. You don't want credentials like database connection strings, keys, or secrets and certificates exposed to the outside world where an attacker could take advantage of those secrets for malicious purposes. Don't add them to your code or embed them in your container images. This approach would create a risk for exposure and limit the ability to rotate those credentials as the container images will need to be rebuilt. You can also read the best practices for cluster security and for container image management. Best practice guidance - To run as a different user or group and limit access to the underlying node processes and services, define pod security context settings. Assign the least number of privileges required. For your applications to run correctly, pods should run as a defined user or group and not as root. The securityContext for a pod or container lets you define settings such as runAsUser or fsGroup to assume the appropriate permissions. Only assign the required user or group permissions, and don't use the security context as a means to assume additional permissions. When you run as a non-root user, containers cannot bind to the privileged ports under 1024. In this scenario, Kubernetes Services can be used to disguise the fact that an app is running on a particular port. allowPrivilegeEscalation defines if the pod can assume root privileges. Design your applications so this setting is always set to false. Linux capabilities let the pod access underlying node processes. Take care with assigning these capabilities. Assign the least number of privileges needed. For more information, see Linux capabilities. Work with your cluster operator to determine what security context settings you need. Try to design your applications to minimize additional permissions and access the pod requires. There are additional security features to limit access using AppArmor and seccomp (secure computing) that can be implemented by cluster operators. For more information, see Secure container access to resources. Best practice guidance - Don't define credentials in your application code. Use managed identities for Azure resources to let your pod request access to other resources. A digital vault, such as Azure Key Vault, should also be used to store and retrieve digital keys and credentials. To limit the risk of credentials being exposed in your application code, avoid the use of fixed or shared credentials. Credentials or keys shouldn't be included directly in your code. If these credentials are exposed, the application needs to be updated and redeployed. A better approach is to give pods their own identity and way to authenticate themselves, or automatically retrieve credentials from a digital vault. Associated AKS open source projects are not supported by Azure technical support. They are provided to gather feedback and bugs from our community. These projects are not recommended for production use. With a managed identity, your application code doesn't need to include credentials to access a service, such as Azure Storage. As each pod authenticates with its own identity, so you can audit and review access. If your application connects with other Azure services, use managed identities to limit credential reuse and risk of exposure. Managed pod identities work great to authenticate against supporting Azure services. For your own services or applications without managed identities for Azure resources, you still authenticate using credentials or keys. A digital vault can be used to store these credentials. With Key Vault, you store and regularly rotate secrets such as credentials, storage account keys, or certificates. You can integrate Azure Key Vault with an AKS cluster using a FlexVolume. The FlexVolume driver lets the AKS cluster natively retrieve credentials from Key Vault and securely provide them only to the requesting pod. Work with your cluster operator to deploy the Key Vault FlexVol driver onto the AKS nodes. You can use a pod managed identity to request access to Key Vault and retrieve the credentials you need through the FlexVolume driver.